I don’t think it’s wise to put much stock in Ubisoft’s release dates. 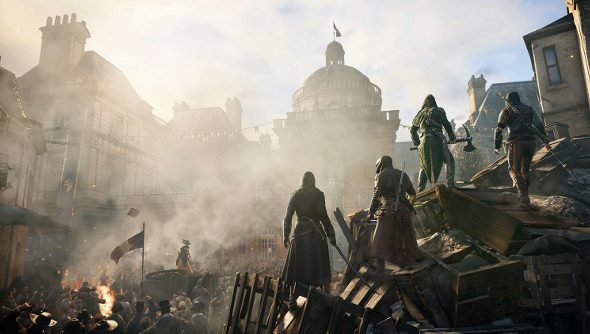 Assassin’s Creed Unity now joins the vast majority of the publisher’s games to be hit with delays. It’s only a very short one, though. Instead of launching in October, it’s been pushed back a fortnight. In the US, folk will be able to get their hands on it come November 11th, while European, African and Middle Eastern customers will have to wait until November 13th. The extra two weeks will give the team time to make minor adjustments and polish Arno’s Parisian adventurers. It does, at least, look like the publisher is sticking to its promise of a simultaneous release7 between PC and consoles. In the past, PC players have been left waiting for Ubisoft games while their console counterparts had been playing for quite some time. Now the disparity is regional rather than based on platforms. The new launch date coincides with the release of Assassin’s Creed Rogue, which inexplicably won’t be launching on PC.